Today, hot melt adhesives industry is witnessing maximum growth potential in packaging, footwear, and automotive sectors. Increasing disposable income along with consumer’s active response toward green revolution is propelling the packaging application. HMAs are extensively used in the packaging of agro- based product, food and beverage and even vegetables owing to its durability, piling strength, and less wrapping cost. It is estimated that the overall market for packaging applications is set to exceed a revenue of USD 3 billion by 2024 with a lucrative annual growth rate of 5.5% over the coming seven years. India, China, and Europe are projected to be the major regions driving the hot melt adhesives industry in this sector. Hot melt adhesives market in footwear industry is gaining high significance on account of its wide implementation in sport shoe. Polyesters and polyamides are the two basic HMAs that are applied for shoe stitching, parts preparation(heels) as they provide excellent bonding specificity. Hot melt adhesives market from footwear application is projected to record a steady growth curve in the years ahead at a CAGR of 4% over 2016-2024. Automotive and disposables sector are other vital application areas for this industry. Disposables application is expected to cross a revenue of USD 1.6 million by 2024 due to the shift in consumer focus toward hygiene regarding adult incontinence items, baby diapers, and other medical disposables products. 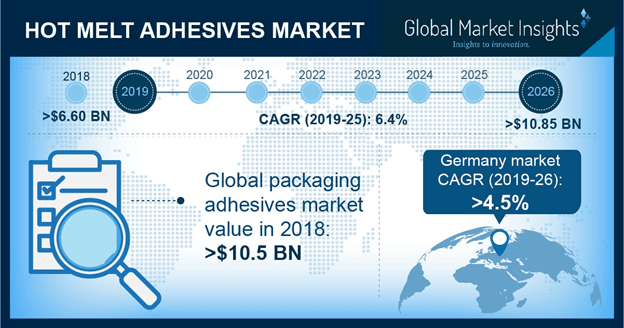 World automotive industry size which is set to surpass 115 million units by 2024, is having a linear impact on hot melt adhesive market. Polyester, EVA, Amorphous poly-alpha-olefin, Polyamide, MPO are the basic product categories of hot melt adhesives adopted in the market. EVA adhesives are dominantly used in packaging, paper, and wood working industries. Owing to the product’s dependability, high quality adhesion, and durability, EVA market is poised to exceed a revenue of USD 3.5 billion in the next seven years. APAC hot melt adhesives market which is mainly driven by the automobile sector, is projected to grow significantly at an annual rate of 5% over the period 2016-2024. Hot line fixing, tail lights, car seats repair, dashboard trims are the some of the extensive arrays of HMAs application in this sector. MPO adhesives are also in high demand fueled by the recent technological interference and FDA initiatives on reliable food packaging materials. Considering the global outlook, Hot melt adhesives industry is mainly driven by three geographies-Europe, U.S., and China. Among the four, Europe will exhibit highest growth rate with an estimated CAGR of more than 4.5% over 2016-2024. Environment favoring initiatives by regulatory bodies like REACH and EPA is expected to stimulate the market demand. Germany is set to prominently address the regional demand. U.S. polyester hot melt adhesives market will register an annual growth rate of almost 5% over the coming timeframe. Strong positive outlook toward textile industry and smart comfortable clothing along with consumer growing claim for light weight automobiles will drive the reginal market. Brazil is also expected to contribute considerably toward the global HMA industry revenue. Global hot melt adhesives market is competitive and highly consolidated with the prominent industry participants investing heavily in product diversification. Henkel, 3M Company, Bostik, Dow Chemical, and Jowat etc. are some of the industry biggies who are continuously enhancing the product portfolio by bringing more of bio-based products in the market.